Storage is perhaps the most common problem that every iPad user is facing today. It sometimes gets too frustrating to have an iPad that constantly gives out the message that there is not enough space every time you try uploading new pictures or songs. Not only do you need to manage iPad memory usage to have a good amount of space to store things that you like, but also having your memory completely filled may mean slower speed and performance. A lot of irrelevant files may take up space thus exposing your device to all kinds of unnecessary threats. Here are some useful tips on iPad memory usage. Given the aforementioned issues arising due to lack of storage space, it becomes essential to manage iPad memory usage. To do so, the very first step is to see how much space you have already consumed. You can check your iPad usage from your device itself. To do so, go to the settings app and then tap “General”. 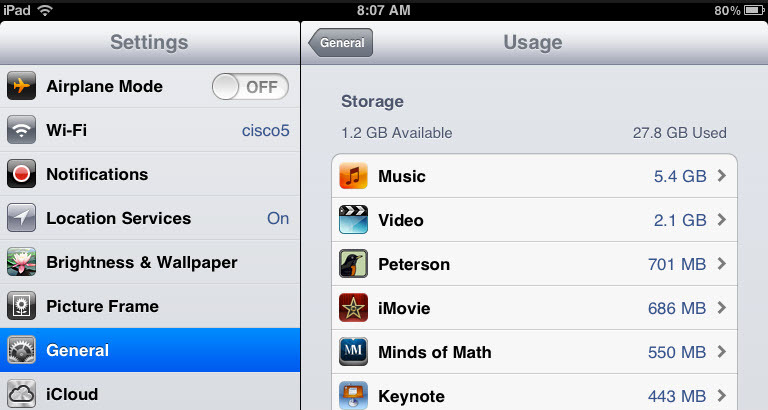 Once you are in, tap “Storage & iCloud Usage” and then “Manage Storage”. You will then see all the apps stored on your iPad and how much space each app has taken. You can also view more information about the app’s space usage by tapping on the app being shown. 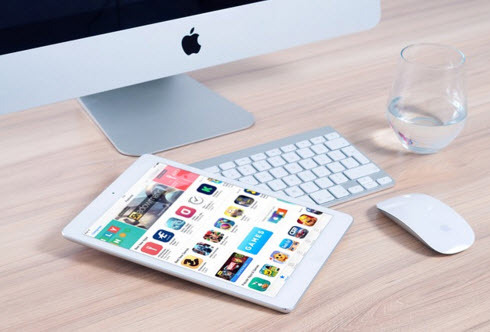 There are a number of ways in which you can clean up your iPad Memory and reclaim the storage space that you once relished so much. This is perhaps the easiest way to increase storage space. However, this may not be a permanent solution and therefore the following will discuss some more robust ways of decreasing memory usage. You may consider removing your iCloud backup file that has become old and thus no longer needed. Deleting the back-up file can increase a lot of space on your iPad. Deleting the back-up data is quite easy. All you have to do is go to settings and tap “iCloud” and then go to “Storage”. Once you are in, tap “Manage Storage”. Tap “Delete Backup” for the device for which you want the back-up removed. Junk files and app caches build up as you use various apps. You may do this by deleting the apps that you may no longer need. Again, it is quite similar to deleting back-up files. You will have to do so using the Settings App. You can delete various photos and video files that are taking up a lot space. Alternatively, if you want to keep these files, you can compress them to free up some space. Deleting such media files that are large in size can free up huge storage space. You can back-up these files so that you will not lose them completely. You can delete the apps that you seldom use. Removing games that are quite large in size is also an effective way of increasing storage. This technique will also improve your device’s performance immensely. These are effective methods to optimize iPad memory usage. However, these techniques can be time-consuming and may result in the loss of some important files. 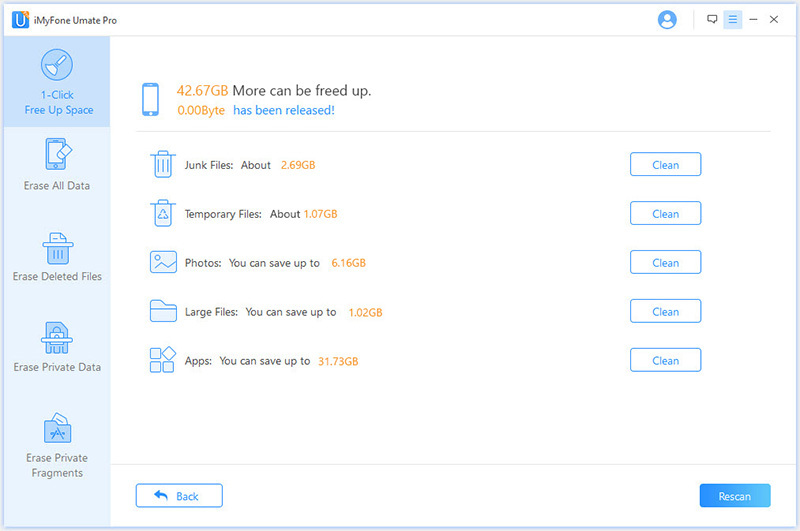 A much easier and effective way to increase storage space is to use iMyFone Umate Pro or iMyFone Umate Pro for Mac, with it, you can do almost all the above tasks by 1-click. It is one of a kind data erasing tool for iDevices. It has 4 cleaning modes designed to cater to various needs. They include; one-click clean-up, erase all data, erase private files and erase deleted files. To clear up you iPad and get back huge space, you can go to “one-click clean-up” tab, it offer you the options to clear up junk and temporary files, compress/delete photos with backup, remove videos with backup, uninstall Apps etc. In order to free up space using iMyFone, follow the steps mentioned below. Click “One-click Clean-up” and then click “Quick Scan”. 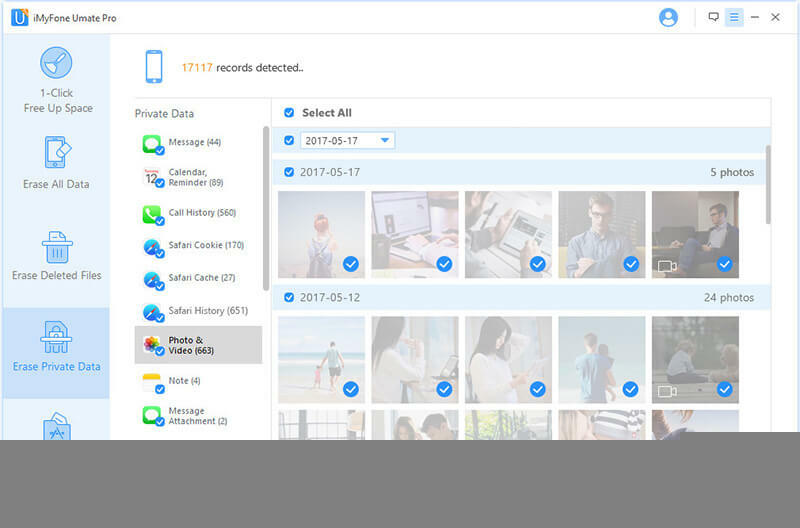 The software will scan your entire device and display the files that can be deleted with the amount of space each category of file is taking. Click “Clean” button besides the option that you want. Then if want to delete no longer need files to optimize iPad memory usage, you should turn to “erase private data” tab. The feature lets you select files individually and allows you to remove those files that you deem private. What’s more, no one can recovery these erased file, even with the most modern recovery software, so as to avoid privacy leakage.